I don't know about you, but if I see another sticky bun/sugar cookie/apple pie/sugared pecan, I'm going to scream. On Saturday, I sent my parents and sister home with an extra coffee cake and six sticky buns, and as soon as they left, I packed the rest of it—Mexican wedding cake balls and apple pie and caramels and chocolates—into the freezer, and slammed shut the door. Firmly. It felt very, very good. Today, I thought it might be nice to talk about Swiss chard for a change. For starters, we just harvested the last of a July row of it from one of our greenhouse beds (the August planting is a little bit wilted, but still holding its own). Also, I convinced Alex to make the Swiss chard gratin from The Art of Simple Food on Christmas Eve, and although he told me halfway through that he thinks following recipes is way too similar to doing high school science experiments, it came out stunningly. In fact, it was one of my favorite dishes on the table that night, which is saying quite a bit. Especially considering it had one of Miss Scarlett's turkeys, a pot of gorgonzola and roasted garlic mashed potatoes, a bowl of sauteed cabbage, another of stuffing, one of creamed onions, a gravy saucer, and a loaf of rye/orange/fennel bread to compete with. Quite a bit, indeed. The recipe was one I'd been meaning to try for a long time. It was one of those things that sounded homey, and warm, and like you could sit down with a bowl at dinnertime and eat just that. It also sounded like a good way to use up a significant amount of Swiss chard, which considering we'd been plowing through the same row, cutting and watching it spring back, for over five months, was awfully appealing. On Christmas Eve, when Alex made it, we all agreed that the greens were perfect, but that it might be a good idea to cut the breadcrumbs back. And since it was so nice, and disappeared so fast, I made it again this morning with a few tweaks, and we ate it with fried eggs and hot sauce for breakfast. It was even better the second time around. And it was much, much better than any sweet. 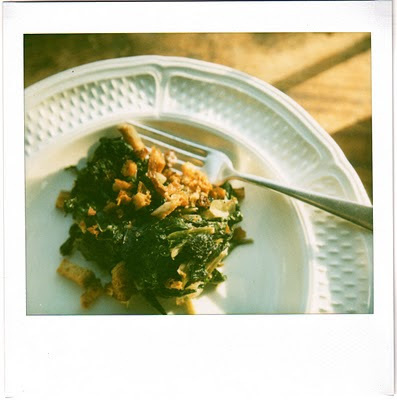 The first time we made this recipe, Alex used fresh chard from the garden. The second time around, I pulled out two bags I had frozen from our garden this summer, and used those. While the fresh chard was maybe just a little bit nicer, I'm not sure I would have noticed that the second batch was made from frozen if I wasn't on the look out. All in all, I think the fact that it was an excellent way to cook frozen Swiss chard more than made up for any slight difference in taste. Whatever you use, I think you'll be pleased. Preheat the oven to 350 degrees F and butter an 8- by 8-inch casserole dish. Wash the chard and chop it into strips. Fill a large pot halfway with water, bring it to a boil, and throw the chard in. Cook the leaves until tender, about 3 minutes, then pour them into a colander to cool. Toss the breadcrumbs and the melted butter together, and spread them on a baking sheet. Bake them for roughly 10 minutes, stirring occasionally, until they are crisp and golden brown. While they bake, squeeze the Swiss chard gently to press out any excess liquid, then set it aside. Then melt the remaining tablespoon of butter in a medium-size pot, and saute the onions for about 5 minutes, or until they are translucent. Add the Swiss chard, season with salt to taste, and continue cooking, stirring occasionally, for roughly 2 minutes. 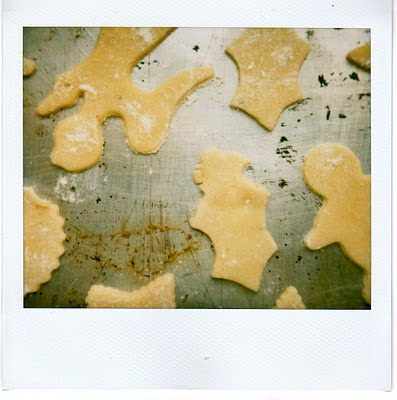 Now sprinkle the flour over top, stir it in, and pour in 1/2 cup of the milk. You want the mixture to be creamy and moist, but there shouldn't be any liquid on the bottom of the pan, so add the remaining milk as needed. Continue cooking for a few minutes longer, tasting and salting as needed. 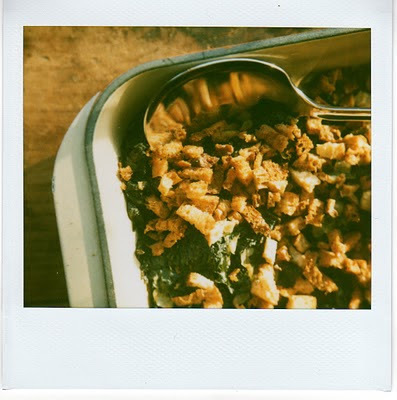 Spoon the chard into the casserole dish you prepared, spreading it around evenly, and then spreading the breadcrumbs on top. Bake for roughly 20 minutes, or until the gratin is hot and bubbling. Serve the gratin warm, maybe with potatoes and turkey or an over-easy pair of eggs. Having been at Elspeth and Alex's table on Christmas Eve, I can vouch for the deliciousness of this dish. And oh yes, I can imagine it is equally tasty w/ eggs -- as are gorgonzola mashed potatoes, I might add! Despite the fact that Alex kept muttering "science project" while following the recipe, I think he was pretty pleased with the outcome. Thanks for a wonderful Christmas, kiddos! I'm afraid, Elspeth, that the difference between you and me is that I will never, never, no matter how oversugared I've gotten, prefer Swiss chard to a sticky bun. Although your chard looks particularly good, I must say. And Tamar, I'm afraid that the difference between YOU and me is that I will never, ever get up the courage to stand on ice, with a hole in it, and catch fish.